Anybody who has known me for longer than two minutes knows that I have a bit of an obsession with bubbles (aka sparkling wine). If you’ve ever attended a class I have taught you will see my energy rise and eyes light up when discussing this particular subject. Simply put, bubbles are my favorite beverage on the planet, with Champagne being my favorite type of bubbles. It is a passion of mine and if I could spend the rest of my days studying just one subject of wine it would be Champagne. I have been fascinated by Champagne and sparkling wine ever since I first became interested in the genre. There is just something so intriguing to me about the process of making Champagne, so much more than any style of wine that I never want to stop learning about it. It was that level of interest that motivated me to seek out and become a Certified Wine Location Specialist, through the Center of Wine Origins, and receive a certification focusing strictly on Champagne and Port. This organization is also one of many promoting Champagne Day today, so continuing with my wine education series, I thought it appropriate to (finally) begin a series on Champagne. Now, I could geek out all day on history and technical bits of information on Champagne, but instead, and for the purpose of this series, I want to start with the basics. I will leave the geekery for my classes. With this short series I hope to clarify some of the questions I have received on Champagne and sparkling wine production. In this first part I will go into some of the basics of Champagne and discuss how it is made. In the next post I will discuss the different styles of Champagne, how to properly open a bottle of Champagne, and chat about sparkling wines made outside the region. “Bubbles” “Sparkling Wine” “Champagne”? What’s the difference? I often use the word “bubbles” synonymously with “sparkling wine”; basically wine that sparkles, has fizz or even a slight effervescence. The first thing to know about “Champagne” is that it is only true Champagne when it comes from the Champagne region of France. Sparkling wine made outside of this region is just that – sparkling wine, or if you’re like me, you can call it simply “bubbles”. It is very important to know this key bit of information. The process of making Champagne within its region is complex, time consuming, highly regulated, and dependent on factors that can only be achieved within this very region in order to create a very high quality product. Don’t get me wrong, there are some absolutely lovely sparkling wines being made in a similar way outside of Champagne, but they are NOT Champagne. 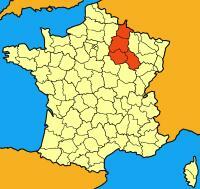 Champagne is a region located approximately 90 miles northeast of Paris, France. While vines have been producing wine in this region since the Roman era, it is only in the past couple hundred years that they began producing it in the method associated with it today (bubbly). Within this region chalk and limestone soils dominate which allow it to produce wines high in acidity (which is key to making good sparkling wine). Its northerly location, about as north as grapes can ripen, is also key for allowing for higher acidity and lower alcohol levels (also very important for quality sparkling wine). Without getting too technical for this overview, it is basically the soils, vineyard conditions, and regulated method of production (described next), that all affect the overall product. This information is key to the quality of the end product. The regulations for making Champagne are very strict, unlike here in the U.S. where methods of sparkling wine are not regulated, although the highest quality sparkling wines here in the U.S. do use this very method (to be discussed in Part II). They must follow these steps below. Permitted grapes: There are three permitted grapes used in Champagne production – Chardonnay, Pinot Noir, and Pinot Meunier. The grapes go through a traditional harvest much like any other wine and undergo Primary (First) Fermentation: This usually results in a wine that is between 10.5-11% alcohol and very high acidity (definitely not ready to drink yet!). At this point the wine is a still wine, no bubbles yet. Assemblage: This is where blending occurs. Wines from different grape varieties, vineyards and vintages are all blended together. This is to create a consistent style year after year so that you, as a consumer, will know that the wine you love right now will likely maintain a consistent flavor year after year. Unlike many other styles of wine that can taste vastly different vintage after vintage, the goal of many Champagne producers is to create a consistent “house style”, reflected year after year. Second Fermentation: This occurs slowly within the bottles. This process can last anywhere from 1-3 weeks. 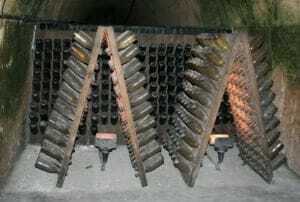 Then the bottles are laid sideways to rest, mature, and age on their lees. The aging on the lees are what aids in the “toasty” “doughy” “buttery” like characteristics. French law requires 15 months of aging after the wine is bottled for non-vintage Champagne and at least 36 months for a vintage dated wine. Time consuming! Disgorging or Dégorgement: This is the process of removing the gob of yeast residue that has now settled in the neck of the bottle. The neck of the bottle basically goes through a process of flash freezing. The lees are now frozen solid and can be carefully removed. The bottle cap is then popped open, and the CO2 pushes the frozen lees right out of the bottle. Addition of the Liqueur d’Expedition: The bottle is now topped up with small measured portion of additional Champagne in order to replace the quantity that was lost during disgorging. This “dosage” also contains a level of sugar that will determine the desired style of sweetness (to be discussed in Part II). Recorking: The bottle is now corked with a proper Champagne cork and sealed with wire cage (for protection), and is almost ready for sale (after a few months of additional resting time). So, as you can see this process is very particular, time consuming, and requires specific equipment (different from still wine production), which is very costly. Many people ask me why Champagne can be so expensive, and my answer is that it is a very meticulous and expensive process to begin with. For those who make Champagne it can be a labor of love, but one so very worth it when you taste the end product! In Part II of this series I will go into the different styles of Champagne, how to open and serve Champagne and sparkling wine, food pairings, and also discuss sparkling wines made outside of the region. True Champagne ONLY comes from the Champagne region of France (that bottle labeled Korbel California Champagne is NOT Champagne, but instead just “sparkling wine”). The primary grapes used in Champagne production are Chardonnay, Pinot Noir, and Pinot Meunier. Most Champagne is a blend of grapes, vintages, and vineyards. The key is to create a consistent tasting wine (“house style”) year after year with the exception of “vintage specific Champagne” which will be discussed in Part II. The traditional method creates sparkling wines of the very highest quality. It is very time consuming requiring specific steps to ensure such quality. Most importantly, Champagne is the greatest beverage on the planet! Don’t even try to debate me on this point because I WILL WIN! And for those of you celebrating Champagne Day today, Cheers! Awesome post! And I would never debate you on this point! What other beverage carries with it the feeling of joy and celebrations right in the bottle!